This post combines the past two weeks into one big bite. I got home from vacation late last Wednesday and quickly had to jump right back in to work and social life as I knew it. A big work event, busy playing catch up, a besties birthday and a personal to-go list that is becoming miles long has me typing as fast as I can to get through this post to continue tackling the others. 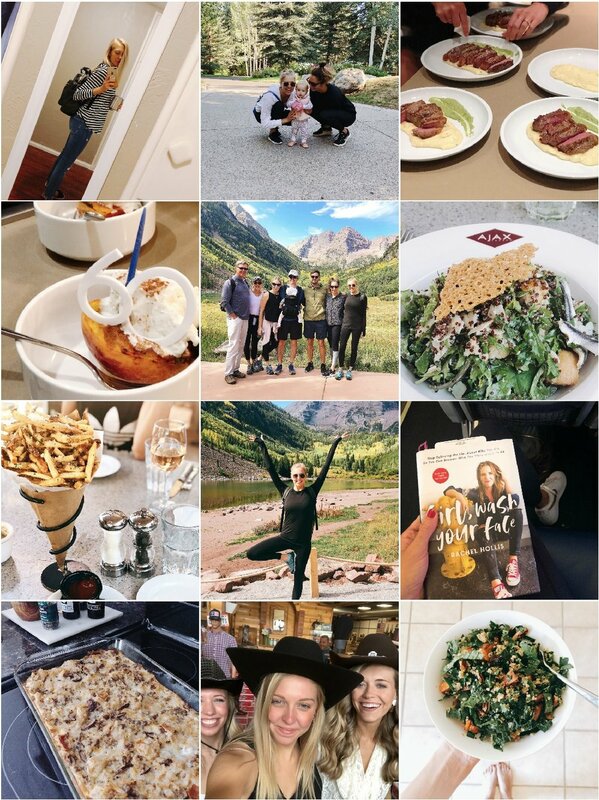 A full round up of our trip to Aspen is in the works! It was too good of a trip not to devote a post to. Catch a glimpse in the snapshots below and stay tuned for the whole shebang! -Channeling “back to school” vibes with my new work bag/backpack - that I can’t get enough of! -We were lucky to get to stay in a big house on our trip. We played to our strengths and cooked a few meals at home. After some delicious nights out, we all agreed our dinners at home were the best! -The reason that brought us to Aspen, Pop’s 60th birthday! His birthday was actually in June, but there are many reasons to celebrate 3 months later! -The whole fam damily! Not often does the whole crew get to be together, but I sure love when we do! -I’ll follow up my kale salad note by mentioning that I washed down my healthy salad with fries at pretty much every meal. It’s called vacation! The infamous truffle fries from Ajax Tavern could not go without ordering. -Just like one of the beautiful trees around me! We had a successful hike through the Maroon Bells. -Book 12 out of my 12 in a year goal. Went out with a bang with this one. Can’t recommend it enough. -The best breakfast casserole returns. Might I add, this is always a crowd pleaser. I brought it to a morning tailgate were it was aside donuts and bagels and many people reached for the casserole over the other options. -Played cowgirl for the day to celebrate our favorite OSU Cowboy’s birthday in Stillwater! -After a the kale salad craze on vacation, I knew I was inspired to recreate one at home. This kale quinoa goodness is coming your way later this week.